Now available in most coastal areas, 4G LTE cellular connectivity provides a very effective, low cost and fast solution for internet connectivity while in port or coastal waters when users want fast access for entertainment and browsing. Digital Yacht said its new 4G Connect solution is geared for workboat, ferry and utility users as well as commercial ships, is simple to fit and can offer ranges of up to 20NM offshore with super-fast connect speeds. 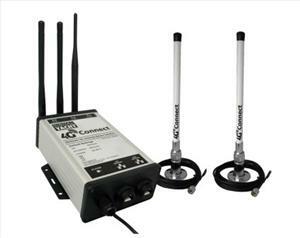 Priced at £499 ex vat, the 4G Connect Pro system is available now and ships with two 45cm external antennas and uses MIMO technology. It has a built in wifi access point which can be set up as a hotspot on board or it can be wired to an existing ship's network. There's also an additional WAN port for connecting to a 2nd internet source such as high power wifi or satellite. It is SIM unlocked so users can plug in a SIM card from any 4G operator. At present there are European roaming deals available from Vodafone with costs of around £25 for 50GB of monthly data. Digital Yacht said it can also provide an interface to onboard NMEA networks so remote, shore-based users can access the ship's data via a secure internet connection.